This religious Christian tapestry "La Virgen De Guadelupe" shows "Our Lady Of Guadelupe" which is the Roman Catholic icon of Mary. It was in 1531 that Juan Diego, an Aztec peasant who recently converted to Christianity, had a vision of a teenage Mother Mary who asked him to build a church where they stood on the hill. Known as the Basilica of Our Lady of Guadalupe, it is an iconic destination and one of the most visited churches in the world. Here we see the portrayal of the virgin of Guadelipe, reproduced in many objects over Mexico as an icon of the mother Mary. We see her in a blue robe, surrounded by a golden halo, and Diego himself at the base. 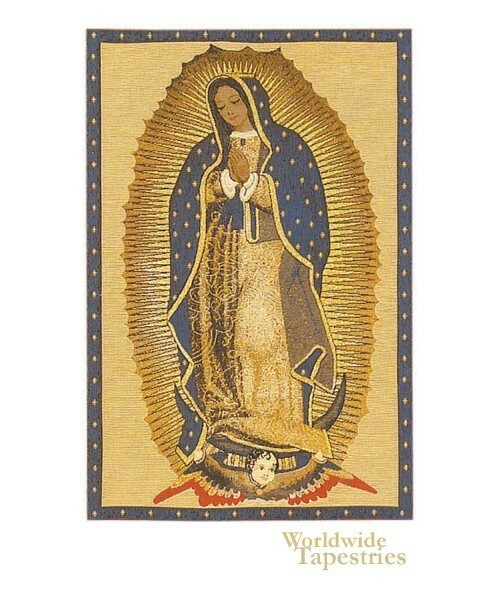 This Christian religious tapestry "La Virgen De Guadelupe" is lined and has a tunnel for easy hanging.